TECHNOCRACY RISING - THE TECHNOCRATIC, NON-DEMOCRATIC ALL CONTROLLING SIDE OF THE NEW AGE - GLOBALIST "NEW WORLD ORDER"? Is Technocracy the most potent arm of the New World Order on which we have obviously embarked. Patrick M. Wood, long time observer of the Trilateral Commission says it well may be. A recent computer magazine I picked up at my local Barnes & Noble said that may be on the verge of entering an age of "quantum computing." This, the article implied, would make our present systems seem like "child's toys." Now that home systems often have 8 to 16 gigabytes of RAM and 1 to 2 terabytes of hard drive space it is hard to think of this type of computing power as minimal. We are, however, told that it well may be. Often our television advertisements tell us that "the internet of everything is coming and sooner than you think!" They say it will be wonderful. I'm personally not so sure. The prophetic ramifications are overwhelming. There is simply no way to make it work without having the humans as well as the equipment wired. In the early 90s the computer and science magazines told us that human interfaces would be coming and that they would be irresistible when they arrived. Patrick M. Wood, himself a highly skilled and experienced financial planner and analyst has analyzed the machinations of a critical globalist organization, The Trilateral Commission, for many years. He and Anthony Sutton co-authored Trilaterals Over Washington in the 1990s. He has also carefully studied the long time emerging "Technocracy Movement" and its declarations. It has obvious parallels, if not complete collaboration with the various "Smart" and "Green" movements which plan to move us from a money based economy to an energy based economy. I have written several articles on this in the past that are archived both here and on NewswithViews.com. Patrick Wood graciously sent me a review copy of his important new book. I note that Carl Teichrib, a fellow researcher I deeply respect, aided in Mr. Wood's research. I respect both men and I am pleased that tomorrow morning, 10 a.m. Eastern time, 7 a.m. Pacific time, Mr. Wood will be my internet radio guest on MY PERSPECTIVE at TMERadio.com. You may listen live, join us in the chatroom and/or call in for the two hour program by calling 208-935-0642. I did not see mention in this book of Social Credit which in my opinion was another and perhaps even earlier phase of this development, but I plan to ask Mr. Wood for his opinion on that as well. It should be a fascinating two hours. Join us in the morning, tune in and Stay Tuned! When I commenced my investigation of my discoveries of an obvious powerful mix of politics and religion in the form of the New Age Movement, I quickly discovered Planetary Citizens and Planetary Initiative for the World We Choose. I was in a unique position to ask for more information as then they did not recognize me as a potential foe of the New Age Movement. I was serving that year on two strategic posts: I was "on the chairs" towards the Presidency of the National Association of Women Lawyers. I also chaired the Family Law Subcommittee of the General Practice Section of the American Bar Association. I had beautiful and impressive letterhead from both organizations with my name engraved on same. I was Secretary and then Treasurer of NAWL. 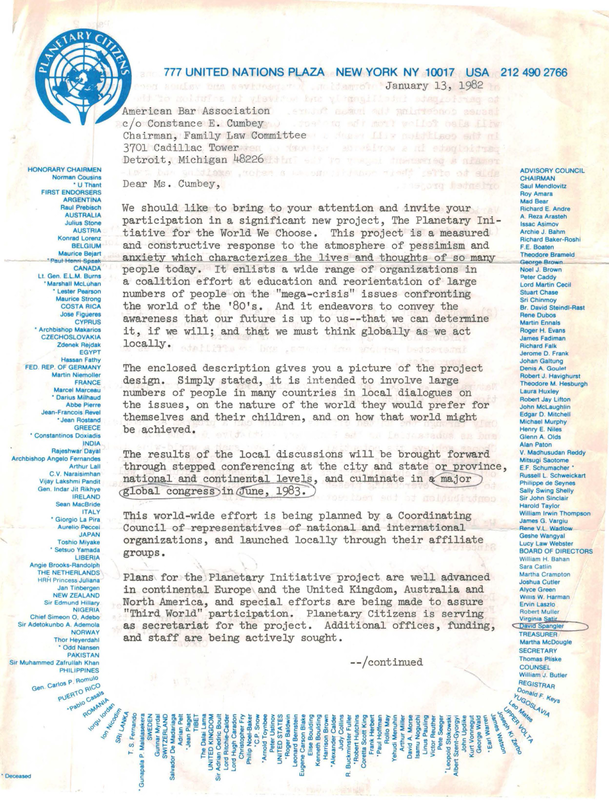 I wrote Planetary Citizens a letter "requesting information to present to my organizatiion." The University of Michigan Bentley Historical Library has been archiving my papers since 2004. Last year they kindly returned 16 boxes of duplicates. In those papers, I discovered this two page personal letter sent me from Donald Keys and Gordon Feller. It was signed personally by both. You will see some of my personal annotations from that time on the doocuments. You will see that many extremely powerful people appear on the Planetary Initiative letterhead. I am attaching the letter in ".png" form. If you click on it, you may enlarge it to full size for computer viewing. You could use a "snipping tool" such as the one that comes with Windows 8.1 and/or Apple computers. As they are very much on the march again, I think you should know the posture they were in before they were unfavorably outed. Donald Keys is reported to have gone off to live an almost hermit existence on Mount Shasta in California. He would be quite elderly by now. For those who tell you there was nothing to the New Age Movement, you may show them this as an important piece of evidence that it was powerfully active with many of wealth and power participating when I came upon its identification and exposure. If you would like a .pdf copy, email me at cumbey@gmail.com and put "Planetary Initiative Invitation" on the subject line. Because theletterhead can be difficult to read, I have charted the names and positions below. As to th e"First Endorsers", I have included their country. 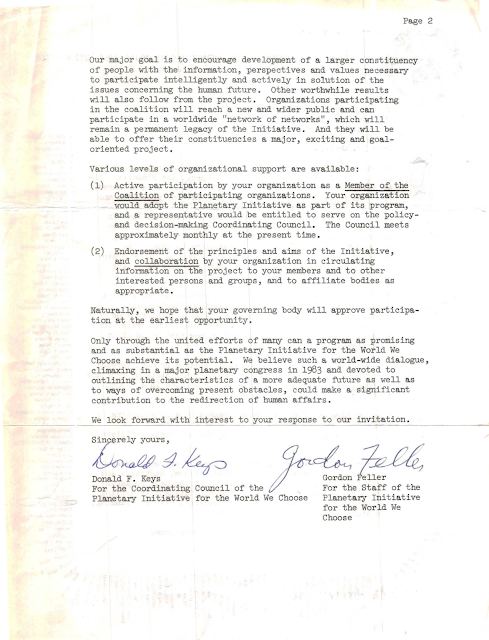 As to the asteriked names in the original letter, it is my understanding they were recently deceased people who had endorsed the project while still living.